Killarney (Ireland) January 2019 – Liebherr Container Cranes have recently handed over four ship to shore container cranes to customers in the USA. 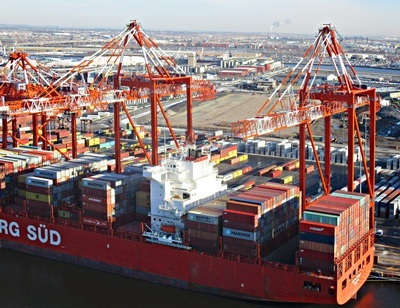 Port Newark Container Terminal, New Jersey (PNCT) has taken delivery of two 69 m megamax outreach cranes whilst Penn Terminals in Eddystone, Pennsylvania has two new Liebherr super post panamax STS cranes. The cranes for PNCT, the first of four new Liebherr STS cranes are part of a terminal improvement and expansion plan, which will see the terminal grow to 309 acres and significantly increase container throughput capacity. The large cranes boast an outreach of 69 m, a span of 30.48 m and a backreach of 20 m. Lift height over rail is 50.3 m and the cranes have a safe working load of 66 tonnes under twinlift spreader. The advanced cranes are fitted with semi automation, electronic anti-sway and a straddle carrier positioning system allowing for increased productivity. Sophisticated laser anti-collision systems improve safety whilst the integration of OCR and a checkers cabin, ensures accurate container tracking. Remote access and diagnostics optimise crane maintenance. Penn terminals’ new STS cranes, feature semi-automation of the trolley and hoist operation, with manual operation only required when operating below the pre-configured safe height. To optimise operations and increase cycle times, electronic anti-sway (sway damping) of the load is provided. Anti-collision systems and remote diagnostics are also included. The cranes have a span of 18.288 m, an outreach of 48 m, a backreach of 15 m and a safe working load under twinlift spreader of 66 t. Penn Terminals is located on the Delaware river 6 miles south of Philadelphia. Liebherr container cranes have a long association with the USA, with the first Liebherr ship to shore container cranes supplied to Texas in 1969. Since that time, Liebherr have continued to work closely with our customers and supply container cranes to the USA. 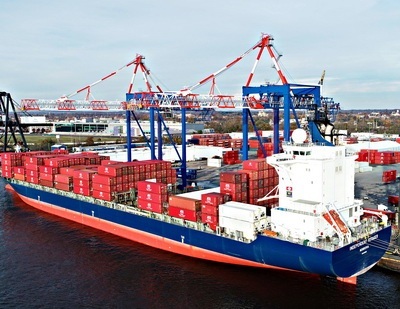 On handover of the final two cranes at PNCT in the coming months, Liebherr will have delivered 20 STS container cranes in the New York/New Jersey area since 2001 with 14 cranes delivered since 2012. Liebherr Ireland was founded in Killarney in 1958 and since 1972 has traded as Liebherr Container Cranes Ltd. specialising in the production of container handling cranes. Today, Liebherr Container Cranes Ltd. Is one of the world’s leading manufacturers of ship to shore cranes, rail mounted gantry cranes and rubber tyre gantry cranes.